Start early — 60 to 90 days before your move date is best. I totally understand, summer is SO busy, but the longer you wait the fewer options you will have, and you will be competing with other prospects who are also feeling a time crunch. Many larger apartment buildings can predict their vacancy well in advance. Look offline — many apartment buildings don’t advertise online, which may mean lower prices or lower demand. When you walk around your target neighborhood, look around for management company phone numbers on signs outside of apartment buildings. In my experiences, many of these buildings still don’t advertise online and can offer below market prices or have greater availability than the apartments that are saturating the online search sites. Ask around — share with friends and co-workers that you are looking to move, they may know of options that are not yet advertised. Here in D.C. we all understand the struggle of finding a good rental, (particularly in the summer) but everyone knows someone who is moving. Longer lease = lower price — A landlord may be willing to accept a reduced rate for an 18-24 month lease since they know there won’t be vacancy early (which can cost them rental income). Be sure to fully understand the terms of the lease and options for vacating early, in case your plans change. Go beyond the application — A cover letter, letter of recommendation, income and credit score documents can improve your odds of application acceptance in competitive situations. Many landlords and management companies will perform background checks but the information they obtain may be limited. 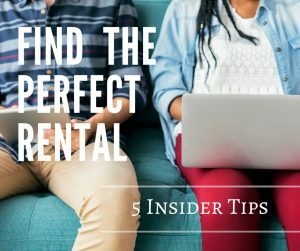 The better you can convey your “tenant of the year” status to the landlord, the more likely they are to accept your application, particularly when there are multiple applicants.